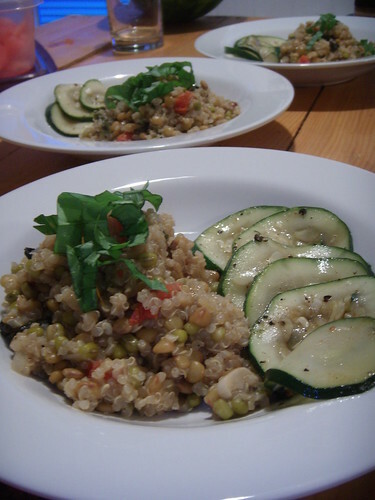 totally broke: lightly sauteed fresh zucchini and curried quinoa, originally uploaded by aarn! +21st July, 2008+. got some fresh zucchini which tasted like butter when it was raw, let it sit in some seasoned rice vinegar, garlic, cracked pepper, sea salt, and a pinch of sugar, and then lightly sauteed until warm. soaked some quinoa with some lentils, mung beans, and some dried black trumpet mushrooms, for a few hours, then strained it and boiled it up with some garlic, sherry vinegar, curry powder, basil, and sundried tomatoes.